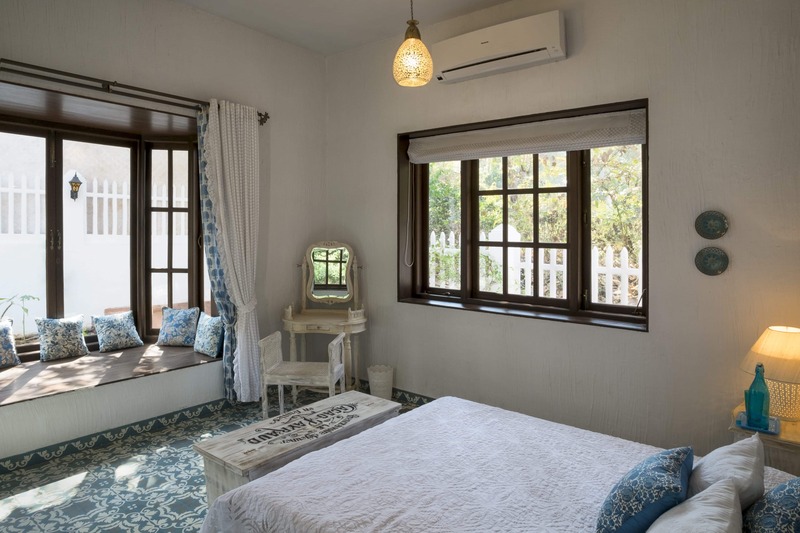 Tucked away in the quaint and quiet village of Moira, the three bedroom luxury hideaway has been crafted with love and attention to detail. 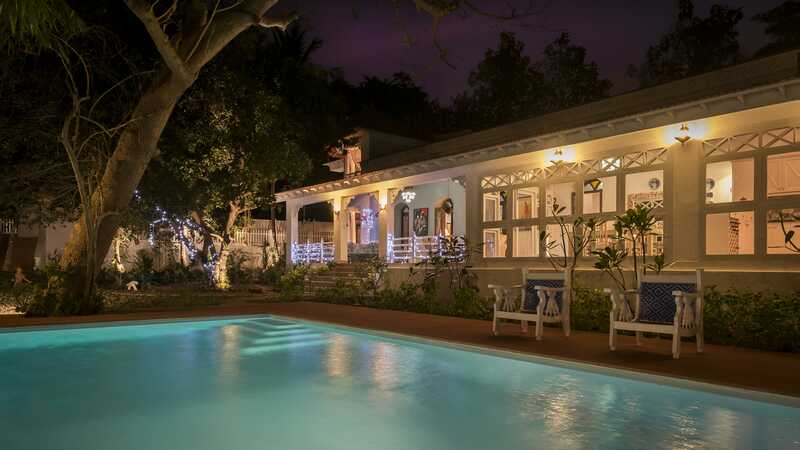 The villa has its own private pool and spa offering a range of therapies to rejuvenate your soul, mind and body. Delicious and wholesome home cooked meals are provided by the in-house chef. Dieticians and yoga classes could be arranged. 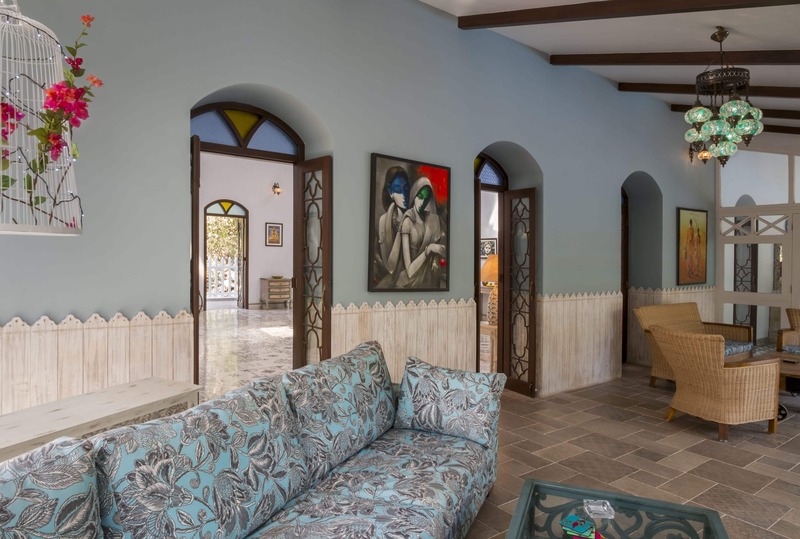 The villa itself is a seamless blend of traditional architecture with modern design elements . It has been featured in Jet Wings International & Discover India magazine as one of the Top Unique Stays in India. The wide yet cosy verandah is the ideal place for family or friends to gathering. It is surrounded by a tropical garden so it stays cool even through hot summer days. 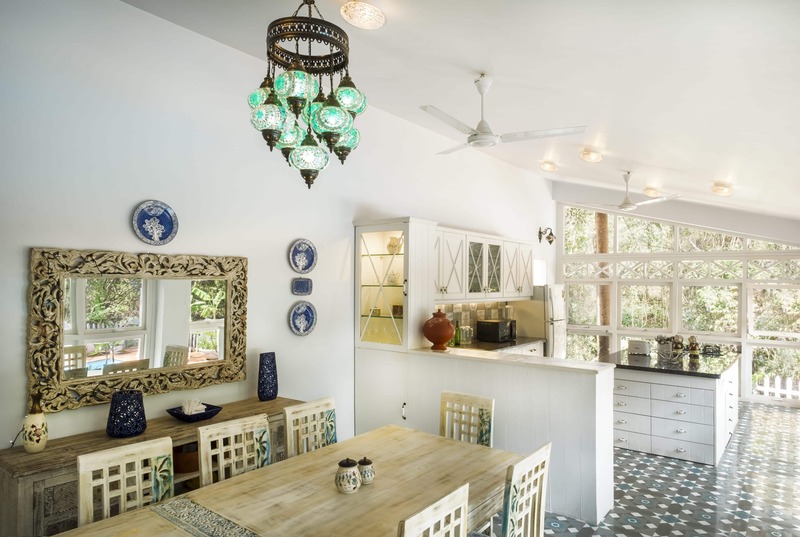 The verandah extends to the dining room and open design kitchen. Large glass windows overlook the sunny pool and lush garden. 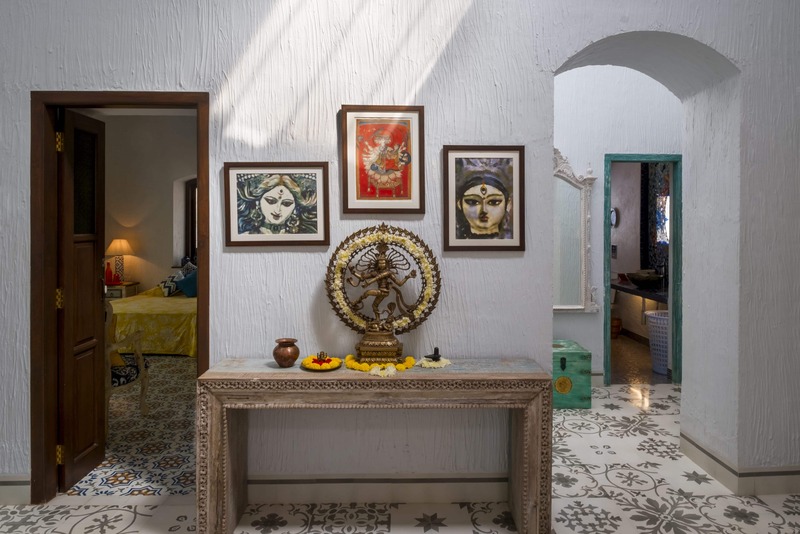 The spacious sitting room with skylights and bright tile work add charm and cheer to the interiors. Natural light and cool breezes make this the perfect space for yoga classes (if required). Each of the three bedrooms have en-suite bathrooms and air conditioning. 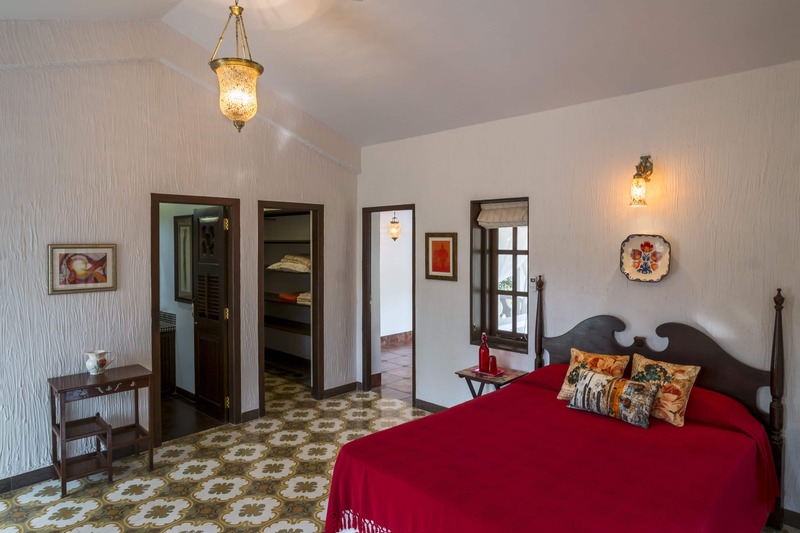 The bedrooms are adorned with tall windows, tiled floors and bright tropical hues of ochre, red, azure and white. Two bedrooms are on the ground floor and the master bedroom is on the first floor with its own private entrance and a balcony that overlooks the pool. The quiet neighbourhood is perfect for long walks, fishing at a nearby river. 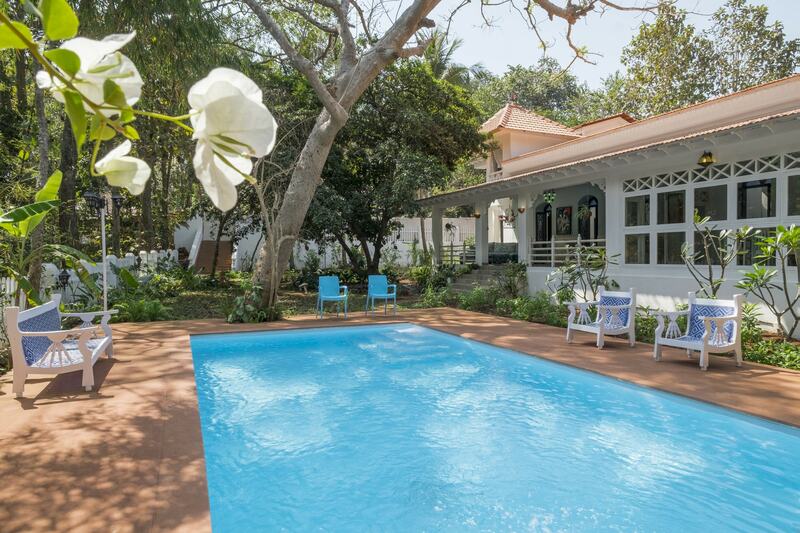 Mapusa market is approx 5-minute drive and the beaches of Ashwem and Morjim are approx. 20 minutes drive from the villa.